receive emails, newsletters and actualities. The freedom to build what you want, the way you want. 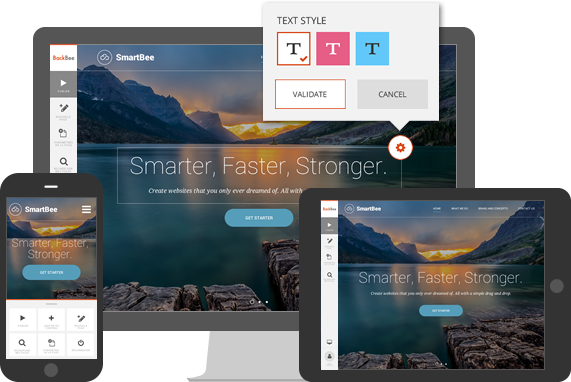 Responsive, professional website themes let you create a website that looks amazing on any device. A complete set of advanced design features make sure your site stands out, no design experience required. All original BackBee URLs can be easily read and indexed by search engines. You can now choose from many modern templates carefully preapred by our team. Find the template that inspires you and start creating your website. Update and manage your site form any device live. Enjoy every moment of working on your site or blog. Customize your template in a few clicks with our Drag-and-Drop Editor. Add and manage your images instantly. BackBee will change the way you share information: it's the only CMS that lets you create web pages directly from your mobile. Working with BackBee is quick and easy. No technical skills, no installation or configuration required. Just register and start building. BackBee is about sharing updates taken in the moment, with a total sense of freedom and full ownership of your content. This is why we are the only platform that lets you publish content straight out of your pocket with mobile & voice editing. Let's get your website online today! Easily track how many people visited your website, which pages they visited, what search terms they used to find your site, and which websites referred traffic to your site directly. Check your site stats from any device.